We have two great heart ‘Felt’ projects today to celebrate the mood of thankfulness in the upcoming Thanksgiving holiday. We feel the a heartfelt thanks is the best kind of thanks! Kyriakos breaks down his process in a tutorial form and Jennifer Vanderbeek has created a full video tutorial on our Youtube channel! Check it out! A card with a heart, made of felt that is decorated with black dots using the Memento Luxe Tuxedo black and enhanced further with the same color irRESISTible Pico embellisher. The canvas fabric, used as background, is stamped with the Delicata Ruby Red with a crackled design stamp imitating heart veins. 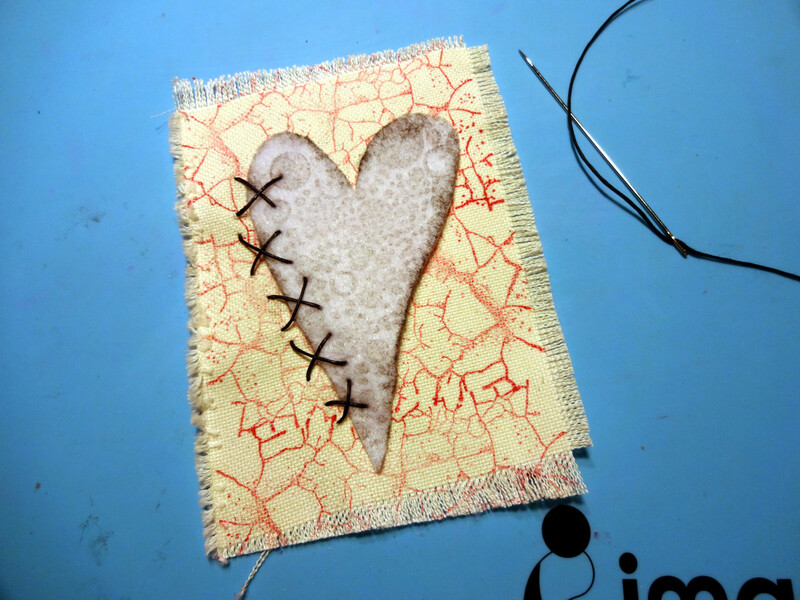 The felt heart is stitched to the canvas fabric with a black waxed cord to one side. Both fabrics come in combination to emphasize the warm, soft and open emotions of a heartfelt person. Cut a heart shape of the felt and stamped it with Memento Luxe Tuxedo Black. 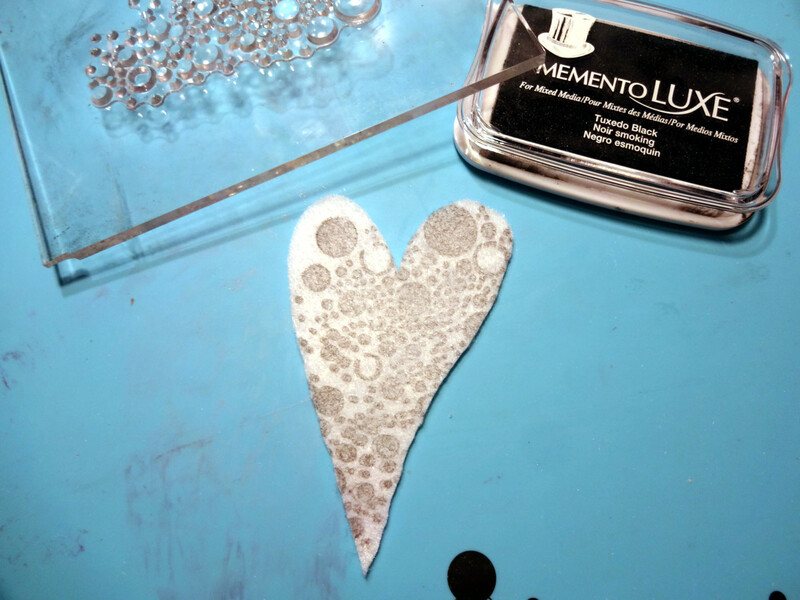 Memento Luxe is a great ink for stamping on fabric because it will not spread so quickly into the fibers like a dye ink. So you maintain the crisp lines of your stamp. Cut a piece of canvas fabric to 4 x 6 inches. 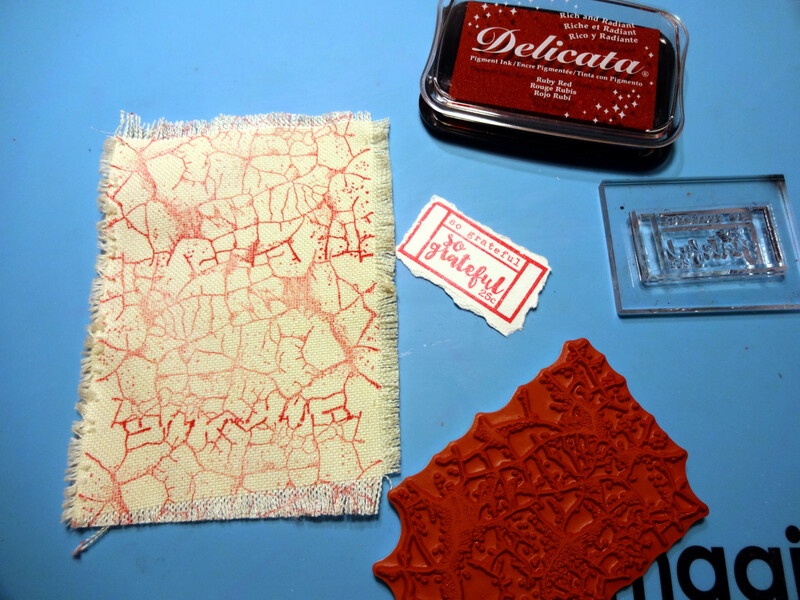 Pull the threads to fridge all edges and stamp it with the crackle clear stamp and the Delicata Ruby Red. Stamp a sentiment “so grateful” ticket with the same color. Cross stitch the felt heart on the fabric using the waxed cord at one side. 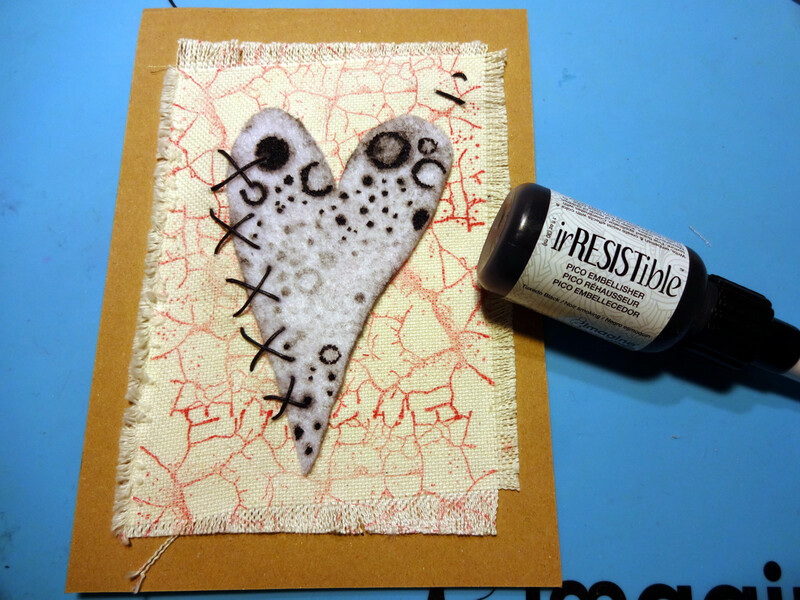 Glue the fabric on the card and use the irRESISTible Pico embellisher to enhance the stamped designs. When it is dry, place the ticket and embellish further. Whoever is lucky enough to receive a card like this will definitely feel the love and effort you put into it—they just might not realize how quickly it came together. When you’re combining a lot of different techniques (we’ve got die cutting, embroidery, hand-lettering, and stamping going on, not to mention paper, felt, and metal elements) it’s important to keep the design fairly clean in order to avoid input overload when looking at the final product. The limited color palette and unfussy arrangement really allow the workmanship to stand out. And who can resist petting the felt heart? If you enjoyed this video from Jennifer, then please subscribe to our Youtube channel for more! This entry was posted in Cards, DIFFICULTY LEVEL, DIY, Fabric, INSPIRATION, Intermediate, Jennifer Vanderbeek, PROJECTS, VIDEOS and tagged cardmaking, Die Cutting, Handmade, Memento Luxe, Mixed Media, On Point Glue, Paper Crafting. Bookmark the permalink. Wow !! Awesome designs !